A Frigate Taking in Sail, artist unknown (William Jackson? 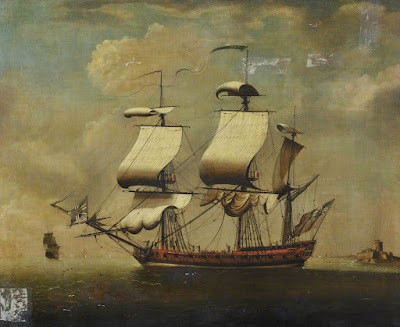 ), c.1780, National Maritime Museum via Art UK. Neither the National Maritime Museum nor Art UK identifies the artist of this piece. I postulate that it was the artist William Jackson. Jackson is mostly known for painting slave ships, but not exclusively. The sails on this piece are painted in Jackson's distinctive style, and given that it was painted during his active years, I would guess (though not guarantee) that it is him. Compare this piece to that of a Liverpool slave ship in the collection of the International Slavery Museum and you can see for yourself the similarities. Unlike his slave ship paintings, this does appear to be a commissioned frigate. Sporting top armor guns much closer to the waterline, and no vents cut for the enslaved below decks, this is a ship fitted out for war and not profit. The crew are clad in blue breeches and a mix of round hats and cocked hats, with both blue and red jackets. You can see the captain gesturing to the crew from just forward of the mizzen mast.